Braun Series 9 9090cc – Brauns Top Model! The Braun Series 9 9090cc Electric Shaver with Cleaning Center is Braun’s most time efficient and comfortable shaver on the market. For those of you guys who have those 3 day beards all the time…get ready for awesomeness! It’s time to meet your maker with the Braun series 9 9090cc electric shaver. In a hurry ? >> See the best price on amazon for the 9090cc here. The Braun series 9 9090cc’s advanced SyncroSonic TM Technology is what makes it able to deliver 40,000 actions of cross-cutting per minute, offering an outstanding shave without sacrificing skin comfort. Intelligent sonic technology is the way to go for a close shave. The new ergonomic design of the Braun series 9 9090cc electric allows for the closest fit between shaver and skin. Cleaning indicator light with cleaning station keeps the product functioning at top performance. This is an efficient and comfortable shaver with top of the line cutting elements. 100% waterproof Wet & Dry allows submergence for up to 5 meters for ease of washing. Able to be used while showering. No time ? >> Get the Top of the Line 9090 on Amazon Here. 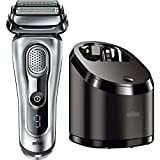 Click here to find the best price for the Braun shaver through Amazon.com. At the moment you can have it delivered with free super saver shipping. The series 9 9090cc is the height of technology and quality, both of which have made Braun the world’s #1 foil shaver brand. The 9090cc model has been proven on 3-day beards to provide an exceptional smooth shave while protecting the face from nicks and cuts. The Series 9 9090CC model is top rated for price and performance. Offers a 60-minute full charge of battery for on-the-go men who demand a product that delivers. The Braun Series 9 offers the world’s first SyncroSonic technology that provides a noticeably different experience that translates into a smooth and close shave every time you use the shaver. Each of the 4 specialized flexible cutting elements performs a unique task, to shave from all angles for maximum results. The Intelligent Sonic Technology removes more hair than any other shaver. The Direct&Cut Trimmer aligns to hair growing in different directions. The patented HyperLift&Cut Trimmer lifts flat-styled hair from difficult areas such as the neck and chin, allowing a close cut. 2x OptiFoil gives the perfect finish to the shave. With the 9090cc you have an OptiFoil on the outside, directCut trimmer next to it, HyperLift Cut Trimmer next and then another OptiFoil on the outside to close off the 2 trimmers. The Optifoil shaves the regular hair really close and smooth even on sensitive skin. Then you have the DirectCut blade that gets hairs that are growing in different directions lined up to be cut. The direct cut trimmer has action that will amaze you. Then you get one more added benefit of the HyperLift which addresses the stubborn hairs that just lie flat so the OptiFoils can make the cuts. You can understand why the Braun series 9 9090cc electric shaver rates high in this 9090cc electric shaver review. This is where the Braun series 9 9090CC really shines. All the blades/heads are floating and pivot with the contour of your face! So, when you are shaving your neck, the heads will align as you go down the face, then when you hit your chin or jaw-line you will see that they adjust with micro movements to keep the pivoting head aligned with your face for a close shave. One thing I want to mention that is also special about the head is that it can lock in 5 different positions so you can dial in the exact angle you need to shave various areas of your face. This works great for shaving the jawline so you can really get it close. The Advanced Clean&Charge system of 5-action cleaning is the only one of its kind. The alcohol-based cleaning station hygienically cleans, charges and lubricates the shaver, plus it automatically selects its own cleaning program, completing the program by drying the shaver with just one touch of a button. The 100% waterproof feature allows for a wet shave while in the shower. The Braun 9 can even be submerged in running water and water up to 5 meters to allow for washing. That means you can wash this under running water without any concerns as well as use this without any worries shaving in the shower. It’s the ultimate wet dry shaver. There is a popup trimmer on the back that you can use for trimming your sideburns and mustache. What the Braun series 9 9090cc Cleaning Station Video in Action Below. The majority of the customer feedback for the Braun series electric shaver has been very positive. There have also been a few complaints made by the reviewers and we will discuss some of them now for the benefit of our readers. One of the most common complaints for the Braun Series 9 9090cc shaver has been about the price of the product. Many of the reviewers said that they loved the shaver and that it did an excellent job, but they felt that it was not worth the price. Some said that they could have purchased an electric shaver for half the price that did as good of a job as the Braun Series 9. Luckily the price has dropped a bit since it’s launch date. There were also some negative 9090cc reviews from customers who had never used an electric shaver before and had a difficult time adjusting to and learning how to shave with this model. Some expressed that it was more trouble than it was worth to figure out how to work the Braun Series 9 9090cc, and further mentioned that it was a complicated unit to use. Finally, some reviewers stated that while the shaver did a pretty good job of shaving their face, it was not as thorough as they would have liked it to be, and they needed to use a manual razor to touch up their shave in order to get a close enough feel. This was disappointing to customers who spent this much money on a product claiming that it provided a very thorough shave. I had a hard time understanding this one as it’s running at 40,000 rpms vs the Braun 790cc that runs at 10,000. I’m wondering if they were not pressing down hard enough on their face. If used properly, the Braun Series 9 9090cc should work perfectly. Despite the negative comments about the Braun Series 9090cc shaver that we have just discussed the majority of the customer feedback has been very positive. What has impressed customers more than anything else about the Braun shaver is the closeness of shave that the product delivered, leaving their face very smooth and knick-free. Many reviewers talked about how, for the first time in their lives they did not have to go over the surface of their skin repeatedly just to get good results. Reviewers also liked the cleaning indicator that notified them when it was time to use the Braun cleaner. Many reviewers mentioned their experience with cleaning their unit on schedule resulting in the product continuing to deliver a great shave. Buyers loved being able to take the shaver into the shower to save time and eliminate cleaning up afterward. This seemed to be one of the features that customers really liked and returned to repeatedly to talk about. Last, what customers really liked about the shaver was that it not only fully charged in 60 minutes, but kept a charge for a long time, due to the newest technology in batteries that Braun is using in their new series. Some of the reviewers were businessmen who brought their shaver along with them on business trips and were very impressed with how quickly they were able to charge the unit and put the Braun 9090cc into action. Would we recommend the Braun Series 9 9090cc Electric Shaver to our readers with the finding in this Braun series 9 9090cc review? The feedback for the Braun series 9 9090cc electric shaver has been very positive and has satisfied many customers. The quality of the product, the overwhelming positive reviews and the high percentage of 5-star ratings by customers gives us great confidence to recommend it. click here to get the Braun Series 9 9090cc Electric Shaver for the best price available through Amazon.com, to have a look at the pictures of it, and to read through the customer reviews in more detail.